Ten Squads, Ten Stories is a series that concentrates on one team in the National Women’s Soccer League (NWSL), and highlights a player or theme. 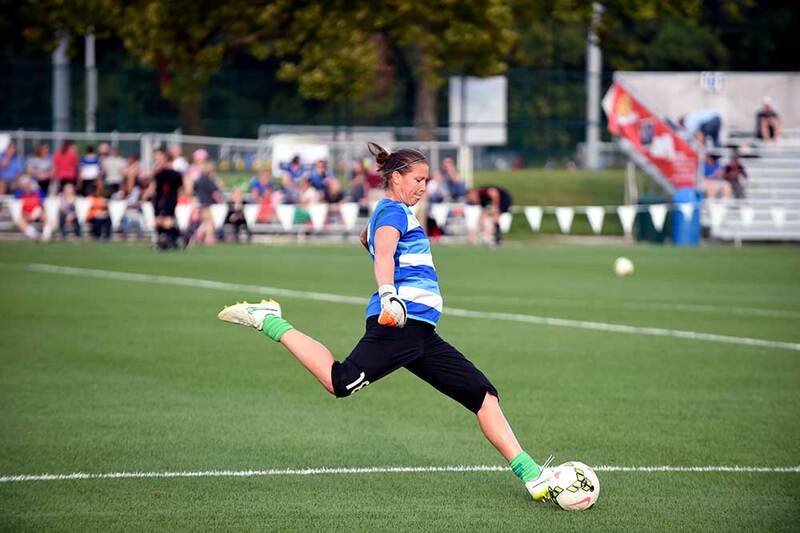 This installment features Nicole Barnhart of FC Kansas City and her stellar performances in net while guiding the team through a transitional phase. Good goalkeepers give their teams chances to win games. Having a goalkeeper who does that week in and week out gives the team a very good chance of getting positive results on a consistent basis. That may sound simplistic and rudimentary. But it’s true, especially in the sport of soccer. If a keeper doesn’t give up any goals in a regular game, the worst thing that can happen is the team earns a draw and picks up a point. Entering the final week of the 2016 season, Nicole Barnhart has made 78 career regular season appearances for FC Kansas City, along with five starts in the postseason. 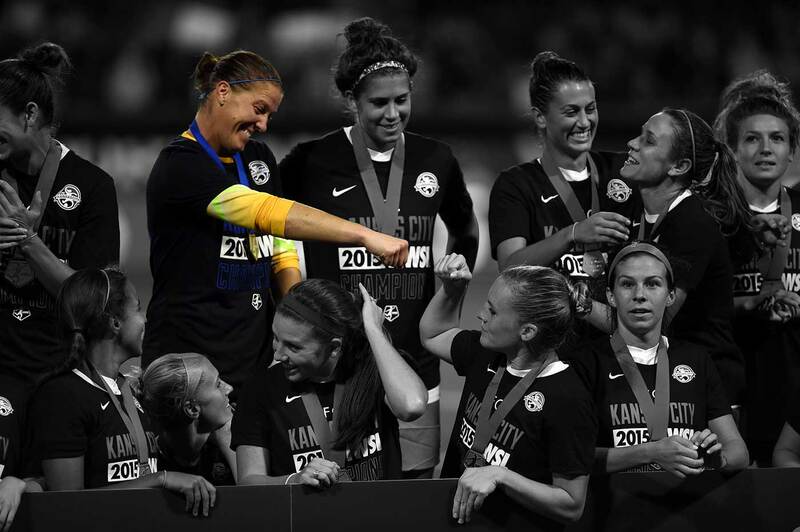 Within those 83 career games, she has kept 35 clean sheets, helped the Blues to two NWSL championships, won the league’s Goalkeeper of the Year honor in 2013, and was named to season-ending Best XI first and second teams in 2013 and 2015, respectively. Statistics, often but not always, don’t lie. In this case, they prove that in the NWSL’s four years of existence, no goalkeeper has been more consistent than Barnhart in her time playing for FC Kansas City. This year will end differently for Barnhart and the Kansas City organization. FC Kansas City will miss the playoffs for the first time in the club’s history. The team can finish only as high as sixth place with a win at Orlando on Saturday combined with a Sky Blue loss at home to Portland on Sunday. There were several forces working against Kansas City heading into 2016. Key players retired after the end of the team’s 2015 title-winning season while others took the 2016 season off while on pregnancy leave. The player shuffle has put the pressure on Barnhart to rise to the occasion to deal with many more dangerous situations in front of her goal than she has had in her prior three years with the team. Rise she has. Barnhart has six shutouts to tie for the league lead and leads the league in saves as well. Even with putting together one of her best club seasons in her career, the competitor in Barnhart still wanted more from this past season and is already hungry toward looking ahead. Barnhart knew coming into 2016 that this was going to be a trying campaign for her. In addition to the players who didn’t return from 2015, this was another season in which national team players missed time throughout the season for the Olympics. So for her to be healthy and ready to go in March was a big plus for FC Kansas City. It also helped that she was able to get herself into a mental state that all goalkeepers strive to reach. That is the state of being locked into a zone for 90 minutes and have all facets of the game work in perfect harmony. For Barnhart, that happened on a consistent basis during this past season. If you ever needed of an example of what getting locked in looks like for a goalkeeper, watch her 14-save performance in Kansas City’s 1-0 win on the road at Western New York on July 23. While nights like this can drive a coach a little crazy, more so for the reason of having the keeper called upon so many times in one match, a performance like that doesn’t just come out of nowhere. It takes a special player to rise up to the occasion and Andonovski noted that it is Barnhart’s tremendous work rate and willingness to improve her craft on a daily basis that has gotten her to reach new heights in 2016. When the NWSL was formed in late 2012, FC Kansas City was a wild card entry into the fold: There were carry-over teams from previous leagues (Boston Breakers, Chicago Red Stars, Sky Blue FC, and Western New York Flash), a team with a link to a strong tradition of women’s soccer from years’ past (Washington Spirit), a team banking on it’s soccer-crazed city (Seattle Reign FC), and a team also in a soccer-crazed city but operating under an Major League Soccer team (Portland Thorns FC). But combining Andonovski‘s work at the coaching helm with Huw Williams’ work as general manager along with the rest of the front office, the players have bought into what the organization has set out to do. You see it now paying off at the end of year four: Players want to come back year after year and enjoy working with each other and playing for one collective goal, which is to represent the club and the community to the best of their abilities. With Kansas City having already been eliminated from the playoffs, the team is already looking toward making a run at the 2017 NWSL Championship. Before that, they do have one more game to play against Orlando, another team that has been out of the playoff picture for some time. Barnhart believes that it will be important for this group, who has improved over the final few weeks of the season, to end on a strong note so the transition toward next spring will look a bit more optimistic. “I’ve think we’ve grown throughout the course of the season and we’ve shown over the past few games the potential of what we have,” she said. It will be a little strange, however, not to see Barnhart in the playoffs. Combining the Women’s Professional Soccer league era along with the four seasons of the NWSL, Barnhart has made the playoffs five out of a possible seven seasons, has a 6-2 overall record with both losses coming after 90 minutes (one being FCKC’s loss to Portland in a 2013 NWSL semifinal in extra time and the other loss occurring in penalty kicks in the 2011 WPS final while playing for the Philadelphia Independence), and has won three titles. But that is what makes Barnhart even more ready for 2017. With the team looking to be at full strength once preseason hits next spring, she is already chomping at the bit to get the next campaign started.